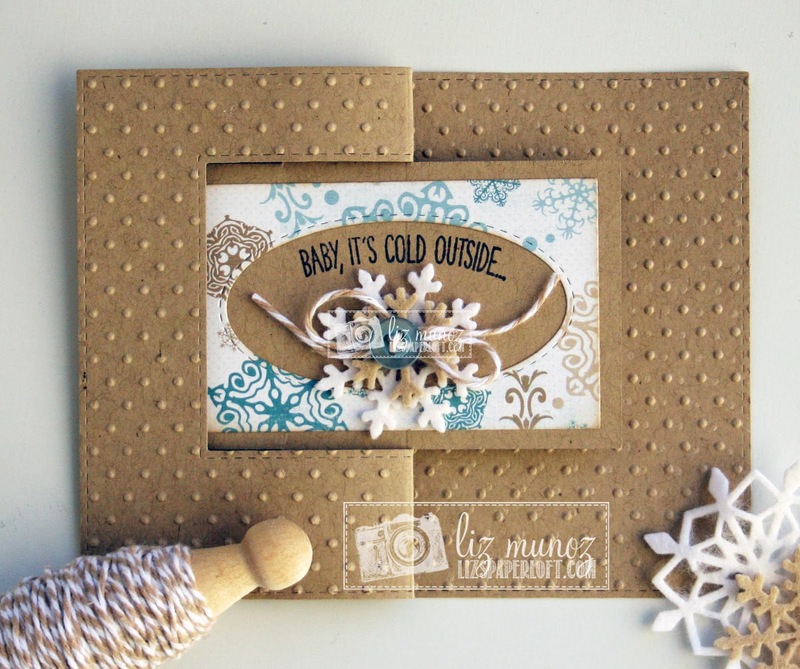 Liz's Paper Loft: MCT ~ Sneak Peeks Day 4 ~ Baby, It's Cold Outside! MCT ~ Sneak Peeks Day 4 ~ Baby, It's Cold Outside! It's Day 3 of My Creative Time 29th Release Sneak Peeks! This week has gone by too fast! My mind is going crazy with all the ideas I'm trying to store for the future with all the wonderful stamps and dies from this release! Oooh you're gonna LOVE what I have to show you today! Maybe not my card, but the die that creates the card I made! That's right it's a flip card, Miss Emma has named it "Stitch Surprise Pop Out card" die. I'm telling you, this is a MUST have die! The possibilities are endless when added with your creativity! "Stitch Gift Card Pocket Die". Isn't that just PERFECT!!! Embellishments and papers used are from Papertrey Ink, Echo Park, Mementos Ink, buttons, and baker's twine. Tomorrow will be the blog hop and then you'll be able to order any of the new stamps and dies! Super job you did on this! Your card is so beautiful. Gosh Miss Liz that embossing you used looks so awesome and good to know that it didn't interfere with the stitching on the die. I love the colors and paper you chose too. I love the shabby chic of it all this is right up my alley. I so love what you created using all of Miss Emma's goodies. Can't wait til tomorrow!! I LOVE your card Liz!!! The Kraft is so beautiful embossed and those felt snowflakes are such a GREAT embellishment!!! Love the colors you used and of course that felt! Beautiful card! Love it! So into kraft right now...and I love the embossing...great idea!!! So cool! I love all the embossed polka dots. Love the embossed background and your color combo. Love how you embossed the card, gives it a total different look! I love your card Liz and I love these dies! lol The embossing looks fabulous and gives such a different look, love how you kept this card CAS, so beautiful! Wow you did a great job, I love your card, thanks for all the ideas! I love your card and the embossing is a great idea. Thanks for all of your inspiration this week. Liz, what a FABULOUS card! The embossing looks so amazing and really gives it dimension! The color combination is fantastic...love it! I am lovin' these awesome peeks! Gorgeous card!!! I love the felt snowflakes and the embossing looks great!!! What a beautiful card!! I love all these new dies and stamps set for this release! card shows it off nicely. Wow, that is a beautiful card. I love how the embossing looks on there. This is an amazing release. Beautiful card-I need to try to use these dies with felt because I love how yours looks!!! Great card! Love the embossing on it, and the kraft cardstock with just a little patterned paper is a wonderful look. What a great way to use paper scraps. Lo e the color combo and details Liz! Gorgeous card! I love those colors together! Liz what a beautiful card and I like how you layered the snowflakes love this new die and gift card pocket!!! I love the soft look of the felt...so cozy! I think you are first to use dry embossing and the swiss dots look super on your card. So cool with the dots on the pocket paper. Super job on your card. Beautiful card Liz. Great design & I like the felt used for the snowflakes. Thank you for sharing day 4 of sneak peeks! ! Carol W.
Your color scheme and felt snowflakes makes your card so pretty. Absolutely amazed, dazzled and delighted! Fabulous showcase! I'm in love with this release! Love the felt snowflakes, so pretty! I love the quality of Emma's dies, they cut so well in my Big Shot. And Emma can lose her mind anytime she wants, LOL. I can't wait to get this release. I might have to get a second job! Your projects are always so FABULOUS....I love the look of felt embellishments! These dies are so AWESOME! Thanks for sharing :) Have a great day! Thanks for showing a closer look at the new dies. Your design is lovely. Love your card. This die is a must have. Can't wait until tomorrow to order. Cool card, like the neutral colors. your card is awesome!! I love it and the colors!! the craft color paper is perfect for the winter months!! love!!! can't wait til tomorrow!! Great card. Love kraft paper and embossing. Wonderful--love this card. The embossing really adds a special touch. Liz, this is so pretty, perfect winter colors! I am so lovin this die! Thanks for a great week-lots of inspiration!! This is right up my Kraft loving alley! Liz ~ STUNNING! 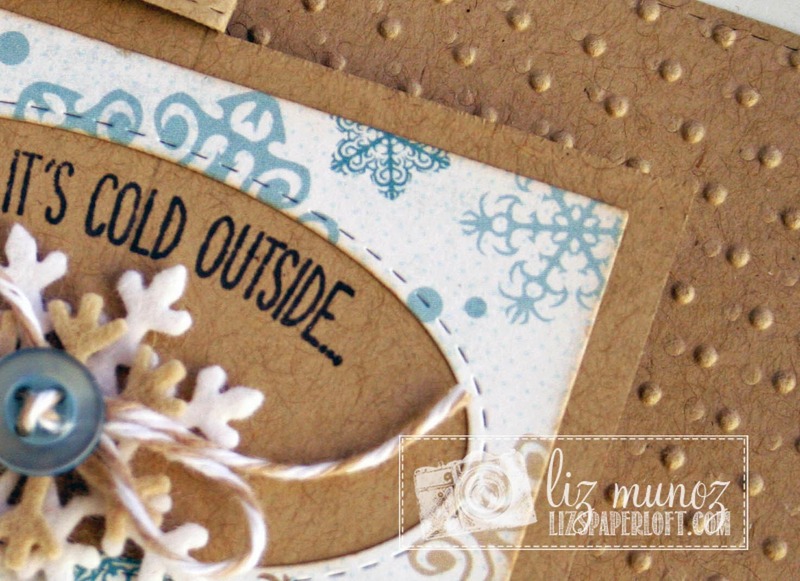 LOVE this die in Kraft, embossed and oh those felt snowflakes! BEAUTIFULLY done! Love the card you made with this wonderful die. Beautiful card, love the dots. So cute, Liz! I love the embossing and how you curved your sentiment!